The famed Mauser K98k was but one of a long line of acclaimed rifles that epitomized German arms. Among the many nations that have employed the Mauser bolt-action weapons over the years for their armed forces are Argentina, Austria, Belgium, Bolivia, Brazil, Chile, China, Colombia, Costa Rica, Czechoslovakia, Denmark, the Dominican Republic, Ecuador, El Salvador, Estonia, Ethiopia, France, Germany, Greece, Guatamala, Haiti, Honduras, Iraq, Ireland, Israel, Japan, Latvia, Liberia, Lithuania, Luxembourg, Manchuria, Mexico, Morocco, Netherlands, Nicaragua, Norway, the Orange Free State, Paraguay, Persia/Iran, Peru, Poland, Portugal, Romania, Saudi Arabia, Serbia/ Yugoslavia, the Slovak Republic, the South African Republic, Spain, Sweden, Syria, Thailand/Siam, Transvaal, Turkey, Uruguay, Venezuela, and Yemen. One estimate of the number of Mauser rifles produced is an astounding 102 million. Many believe that the Germans marked every rifle with a secret factory code, a date code, and military inspection stamps with proof marks, depending on where the rifle was manufactured. Several Mauser rifles were built in captured factories in Belgium (Browning) and also in the former Czechoslovakia (CZ Brno), now the Czech Republic. More rifles were built that were intended for other countries as well. The “bnz” code with the single Gestapo rune and the “41” code signify that a particular rifle was manufactured that year for the German Secret State Police, many at the SS concentration camp in Styr, Austria. The famous Nazi eagle—both with and without an associated inspector number—appeared on rifles produced during 1935-1945. These two markings were stamped on various individual parts depending on when and in which factory the rifle was manufactured. The notorious Totenkopf (death’s head) was affixed for a small number of rifles that were intended for use by special SS troops, stamped on the barrel on the left side immediately ahead of the receiver. This same death’s head was sometimes also stamped to the underside of the stock immediately behind the trigger guard in the underside of the grip. Of particular interest are some sniper rifles that make use of the original long-eye relief system. They are the famous ZF-41 models with the long-eye scope mount built into the rear sight base. Some sniper rifle models have high turret mounts, while others have the German long claw-type mounts. Even today, Mauser rifles are highly regarded globally for their strength, reliability, and legendary accuracy. In 1866, the year of the Prusso-Austrian Six Weeks’ War that saw Prussia reign supreme within the various German states, gun maker Peter Paul Mauser developed his self-cocking system for the Dreyse needle rifle. Peter Paul Mauser was born on June 27, 1838, in Oberndorf am Neckar in Wurttemberg, Germany. Brother Wilhelm was four years older, and their father, Franz Andreas Mauser, was a gunsmith at the Wurttemberg Royal Armory, established by King Frederick I on July 31, 1811. Mauser senior married in 1819, and the couple eventually had 13 children. Another Mauser, son Franz, immigrated to America in 1853 and worked at E. Remington & Sons. Peter Paul Mauser was drafted into the Prussian Army in 1859, becoming an artilleryman at the Ludwigsburg arsenal, where he began his own career as a gunsmith. Using the Dreyse needle gun as a model, Mauser developed his own rifle with a turn bolt mechanism that cocked the gun as it was manipulated by its firer. At first, this weapon also used a firing pin that fired a rear ignition cartridge. 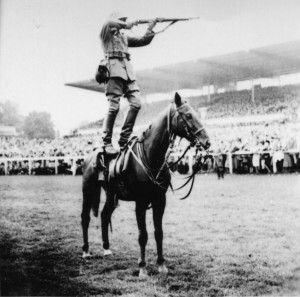 A German Army cavalryman fires his Mauser 98 rifle standing atop a horse in a prewar demonstration. Although the Mauser was shown to many governments, it was only after the Prussian victory over Hapsburg Austria in 1866 that the famed American gun maker Remington & Sons showed any real interest in Mauser’s new invention. Remington’s Samuel Norris felt that the design could be made to convert Chassepot needle guns to fire metallic cartridges, and soon thereafter a partnership between Norris and the Mauser brothers was formed in Oberndorf, Germany. The company was moved to Leige, Belgium, the following year, but when the French showed no interest in a Chassepot model, the partnership was dissolved. By mid-1870, both Mauser brothers, Peter Paul and Wilhelm, returned to Oberndorf, where they continued developmental work on the new rifle. The Royal Prussian state accepted the weapon for service on December 2, 1871, just after the Franco-Prussian War that defeated Imperial France and united Germany around Prussia’s steel core had been concluded. Thus, the Mauser did not come on line until February 14, 1872, in the early years of the new German Empire. The delay had been occasioned by the military, which required a design change to the safety lock. While official government arsenals and larger German industrial firms received contracts for actual production of the new weapon, the Mauser brothers were awarded an order for 3,000 sights, produced by the Xaver Jauch factory starting on May 1, 1872. After the brothers received a contract for 100,000 more sights, they bought the Royal Wurttemberg Armory in the Neckar River valley, and there they built an Upper Works in 1874. That same year, they received another contract to manufacture 100,000 Model 71 rifles. They also had a trio of factories in Oberndorf under a new partnership formed between the brothers and the Wurttemberg United Bank of Stuttgart in Saxony, one of the new federated German states within the empire. Wilhelm died on January 13, 1882, and the following year the partnership became a stock company named Waffenfabrik (Arms Manufacturer) Mauser. Paul Mauser’s shares were sold in 1887, but he stayed on as the firm’s technical director. Mauser AG was formed a decade later; and after World War II, it was renamed the Industrial Works Karlsruhe AG. In 1888, the Year of the Three Kaisers in the Reich, the German Army introduced the Model 1888 Commission Rifle, along with a modified Mauser action and a Mannlicher-style box magazine, with an additional carbine version, the Karabiner 88. Both were updated in the early 1900s and saw service in the Great War of 1914-1918, but the Gewehr 88 was not a fully Mauser-designed and -engineered rifle. A smokeless powder was introduced that provided its users safety from return enemy fire with its 7.92mm round, a rimless cartridge that allowed for smoother feeding for both rifles and machine guns. The initial bullet had a rounded head, while several redesigned versions, including the spitzer bullet and boat tail, brought the cartridge to its later potency. The Mauser 91 adopted a 7.65mm, round-nosed cartridge. Ironically, the 89 Mauser rejected by Germany in 1884 entered service in 1940, when it was issued to secondline German Army units in Norway, Denmark, Holland, and Belgium. The Model 1893 Mauser became known as “the Spanish Mauser” and was used by the Spanish Army against the Americans in 1898 at the Battle of San Juan Hill. The use of smokeless powder gave a serious advantage to the Spanish soldiers in Cuba, when they faced the American with their U.S. Army Springfield rifles. That same year, the Imperial German Army of Kaiser Wilhelm II purchased the Model 98 Mauser design rifle that officially entered service as the Gew. 98 on April 5. “This remains by far the most successful of the Mauser designs, helped of course by the onset of two world wars that demanded vast numbers of rifles,” commented one arms expert. Peter Paul Mauser died on May 29, 1914, just before the start of World War I that August. It was in large part the tragic events of World War I that helped immortalize both his name and the weapon that bore it. The Mauser Model 98 and its several variants included both a five-round and a 20-round box magazine. 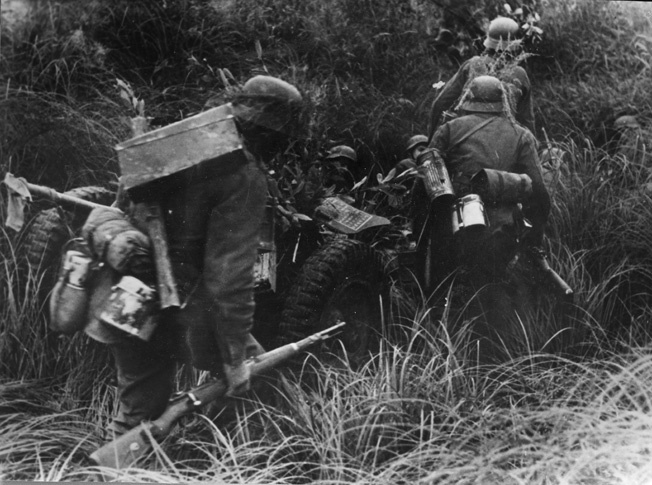 During a counterattack near Orel on the Eastern Front, a German soldier is seen carrying his trusty Mauser rifle. The reliable Mauser was exported to numerous countries and is still in use today. Originally, the German Imperial cavalry used the shorter carbine versions, and by 1918, the new special storm troop trench units also employed Mausers. Both empire and republic came and went, and under the new Third Reich of Adolf Hitler in 1935, the Mauser Karabiner (Carbine) 98 Kurz (Short) was adopted as the standard German Army infantry rifle. It served in that capacity until the end of World War II a decade later. In 1941, the Mauser Company took part in a competition to re-equip the German Army with a semi-automatic rifle as well, but the Mauser-designed version failed miserably on testing and was cancelled after a short production run. Under the French Army, the entire factory at Oberndorf was dismantled, and all its records destroyed. In the initial postwar years, the Mauser Works made precision measurement instruments and tools, such as micrometers. Former company engineers saved what they could and founded the later famous firm of Hechler & Koch. Mauser continued to make hunting and sporting rifles, however, and in 1994 became part of Rheinmetal AG. In 1999, the civilian manufacture of hunting, defense, and sporting rifles was split off from Rheinmetall. Numerous Mauser surplus military rifles entered the peacetime civilian market, where they remain today. Through the decades, the firm also made several military pistol models. These include the C1896 pistol; the Mauser 1910 and 1914 pocket pistols; and another such model 20 years later in 1934, under the Nazis; plus the 2008 Mauser M2 handgun. In 1954, Mauser as a firm bearing that famous name was formally reestablished. In 2004 it became a subsidiary of SIG SAUER firm, one of the largest firearms manufacturing entities in the world. In 1985, both Heckler & Koch and SIG SAUER lost out to Beretta USA of Accokeek, Maryland, and Italy for a contract to build the U.S. replacement for the venerable Colt Model 1911 .45-caliber sidearm pistol. The initial contract was for $57 million, one of the largest handgun contracts ever. Tags Battle of San Juan Hill, Imperial Germany, Mauser rifle, Nazi Germany, Peter Paul Mauser, Spanish-American War, World War I, WWII. I was surprised that this article didn’t mention that the venerable US M1903 Springfield (the 30-06) was a knock-off of the Mauser. This was proved in court, forcing the Springfield Armory to pay a royalty to Mauser. I have both an ’03 and an Argentine Mauser, and the similarities are obvious. These are “shooters,” not collectable, and more than a century after the designs were formalized, they continue to shoot true. I am looking for the history of argentine 7.62×53 Mauser can some one help please.